Once per turn, Bu Lian Shi can choose two other characters with different numbers of hand cards. The character with fewer hand cards displays and takes a hand card from the character with more hand cards. If it is not a spade, Bu Lian Shi draws one card. When Bu Lian Shi dies, she can choose any player that did not kill her. This player recovers one health and draws three cards. 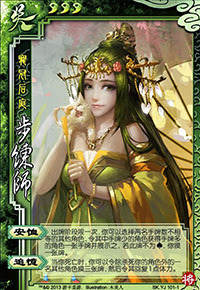 When Bu Lian Shi activates "Pity," she cannot choose herself as one of the two characters to exchange a hand card. When Bu Lian Shi dies, she does not need to activate "Memory." If Bu Lian Shi targets a character who is at full health when she activates "Memory," they simply draw three cards and they do not gain any health. "Pity" is more impressive when used in a game than it sounds on paper. It gives Bu Lian Shi's team a 2.75 card advantage, as an enemy loses a hand card, an ally gains a hand card, and Bu Lian Shi has a 75% chance of instantly drawing a card. 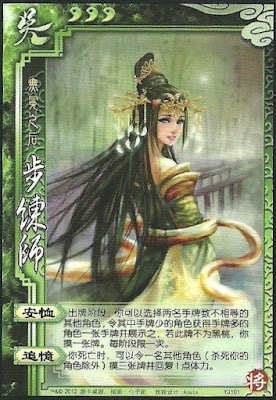 Unlike many other abilities that drain characters of their hand cards, this ability does not require Bu Lian Shi to discard cards or skip any portion of her turn. Even if there is no way for Bu Lian Shi to activate "Pity" to make an enemy with more hand cards give a hand card to an ally, Bu Lian Shi can use this power on two characters from the same team. This does not cause a net card advantage/disadvantage for either team, but Bu Lian Shi will likely get to draw card for activating this ability. Bu Lian Shi really needs to have a team in order to be effective. Her character abilities are useless in a one-on-one situation. If there are multiple people in the game and Bu Lian Shi has no teammates (such as when Bu Lian Shi is the spy), "Memory" is worthless. Even if Bu Lian Shi is a member of a team and she is not the last to die, this power is not very powerful. The drawing of three cards and the regaining of one unit of health is not very significant. Bu Lian Shi is a very fragile character. She only has three units of health and no abilities to rely upon to keep herself alive outside of her turn. Additionally, "Memory" is not a very strong deterrent to prevent enemy players from killing her. Xu Shu/Liu Bei - These characters have abilities that allow them to give or discard their hand cards to give cards to other characters. Because these characters often end their turns with few or no hand cards. Bu Lian Shi can use "Pity" to benefit them more easily than other characters. Zhang Fei/Yan Liang & Wen Chou/Yuan Shu/Yuan Shao - These characters have abilities that are very expensive in terms of hand cards. Bu Lian Shi can use "Pity" to benefit these characters. King Bu Lian Shi is a poor king choice. She has no defensive abilities and "Memory" cannot be activates when she dies because the game will end when this occurs. Rebel Bu Lian Shi is a competent, but not outstanding rebel. Again, she can use "Pity" to help weak rebels, but she is very fragile and her role puts a three card bounty on her head. Spy Bu Lian Shi is a weak spy. While "Memory" can be helpful in keeping the game somewhat balanced, it is not usually powerful enough to tip the balance in favor of one of the teams. Additionally, "Memory" is useless when Bu Lian Shi takes on this role because she will have no further interest in the outcome of a game if she dies as the spy. While Bu Liang Shi is better in practice than she is on paper, she is still one of the weaker characters in San Guo Sha. "Pity" is not a bad ability, but "Memory" usually does not affect the game very much when she dies. Avoid using her as the spy and in one-on-one situations.